Baller bands have broken into the mainstream after making big waves in sports. 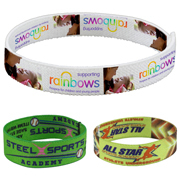 BrandBand Bracelets are now one of the most sought after promotional items. Hip and modern, these branded bracelets come in woven-in and standard silkscreen types and they provide a great space to highlight a logo. They are perfect as corporate gifts during trade shows and conferences. 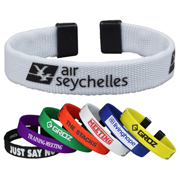 The company logo can either be woven into the bracelet or printed by silk screen. They are made of 100% polyester so they’re durable and lightweight. 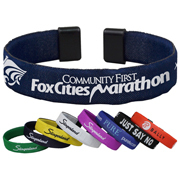 The brandband bracelet is a fun and lighthearted medium for corporate and event branding. Trust Innovation Line to deliver the coolest promotional items. They have been in the business for 30 years now and have served thousands of happy and satisfied customers.